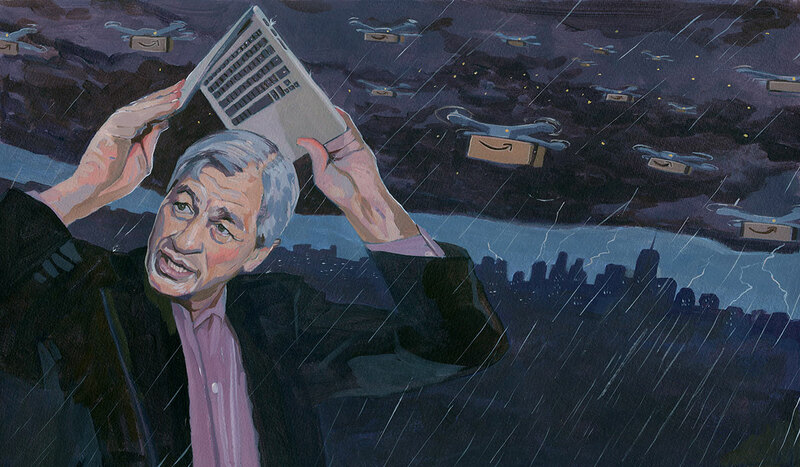 The JPMorgan Chase CEO rushes to turn his bank into Amazon before Amazon turns into a bank. Nowadays at JPMorgan Chase, a first-time wealth management customer can open an investment account in three minutes by mobile phone rather than waste the morning at a branch signing a ream of documents. At the corporate and investment bank,institutional investor clients can benefit from AI-powered software that scans myriad financial reports to locate companies likely to issue more debt or equity. And at the retail bank, customers are invited to test out new apps while researchers hidden behind two-way mirrors look for signs of frustration in their faces and body language. Under long-serving chairman and CEO Jamie Dimon, the largest U.S. lender has become the clear technological leader in the banking industry. “Mobile first, digital everything” is the mantra repeated at investor conferences and on quarterly earnings calls. And JPMorgan is backing the talk with money — lots of it. $20 billion into new products for digital banking, investment advice, trading, and cybersecurity. A frequent visitor to Silicon Valley, Dimon has partnered his bank with fintechs in peer-to-peer consumer payments and small business loans, online mortgages, and auto financing. Instead of fearing fintechs as disrupters, JPMorgan treats them as subcontractors — and has invested in more than 100 of them. In fact, Dimon expects that JPMorgan’s real rival will turn out to be Amazon rather than another bank or a fintech. “We are prepared for that to take place,” he says in an exclusive interview with Institutional Investor. For now, though, Dimon discounts the threat posed by the giant internet retailer. His bank is even fostering Amazon’s growing involvement in financial services through mutually beneficial ventures and purchases of Amazon products and services. No doubt Dimon and other bankers are reassured by federal regulations that prevent Amazon and other commercial enterprises from becoming full-service banks. But those barriers could be lifted in coming years if Chinese internet behemoths like Alibaba, Tencent, and Baidu — which don’t face such regulatory shackles at home or in many foreign markets — continue their explosive growth in financial services. In sharp contrast to its assaults on other economic sectors, Amazon has cultivated the image of partner rather than disrupter in banking. Like other banks, JPMorgan uses Amazon’s industry-leading cloud services for big chunks of its storage and computing. The bank’s traders increasingly ask Alexa for research reports and share price projections. JPMorgan and Amazon have a co-branded credit card for Amazon Prime members. And JPMorgan is a leading candidate for potential joint ventures with Amazon involving retail checking and business credit card projects. Such talk doesn’t faze Dimon. With a market valuation that has almost doubled over the past two years, to $388 billion, his bank has enough heft and momentum to feel comfortable dealing with Amazon, whose market cap is twice as large. “I have enormous respect for what they have done,” says Dimon, a longtime friend of Amazon founder Jeff Bezos. JPMorgan would dearly love to have more access to the growing millions of Amazon clients. It also hopes to emulate Amazon’s unmatched level of customer service. “Amazon not only sees market trends — it can create them,” says Lori Beer, who as chief information officer oversees technology at JPMorgan. Bezos to join Amazon itself. At the time, Dimon was at loose ends. As president of Citigroup, he seemed destined to succeed his mentor, Sanford “Sandy” Weill, the chairman and CEO, but was instead fired in 1998 by the older man, who did not want to step aside. Dimon explored the booming world of dotcoms, but decided in the end to join Bank One in Chicago, where he became CEO in 2000. JPMorgan Chase acquired Bank One in 2004, and two years later Dimon again scaled the summits of the financial world — this time successfully — preaching the promises of digitization. Shortly after becoming JPMorgan’s chairman and CEO in 2006, Dimon announced that the bank would build its own technology platform instead of outsourcing tasks as other banks continued to do. Technology is a bank’s most important capital expenditure; by owning the technology, a bank can get its financial products to market faster, improve risk management, and do better at capital allocation — three essential building blocks for a higher return on assets. JPMorgan emerged from the financial crisis fitter than the three other big U.S. banks — Bank of America, Wells Fargo, and Citigroup — and continued spending heavily on digitization while rivals focused on slashing expenditures and selling off assets. Currently, JPMorgan devotes more than 10 percent of its revenues to tech expenditures. That’s a massive amount, especially considering that it’s impossible for outsiders — including analysts and investors — to measure the payback from spending on specific products and services. Thus, for example, the bank congratulates itself on driving down the marginal cost of electronic trades to close to zero and reducing expenses for check deposits by 94 percent. But the internal rate of return for the digital spending on these services remains a mystery. “Ultimately, the payback to look for is operating leverage: Are revenues growing faster than expenses?” says Graseck. “And over time, JPMorgan has done better than its peers.” Last year the ratio of expenses to revenue at JPMorgan was 57 percent, considerably better than Bank of America’s 63 percent and Wells Fargo’s 66 percent. But in other respects, JPMorgan’s efforts at improving efficiency have drawn skepticism. Despite the lip service and the spending on digitization, no major bank has been more reluctant to reduce its branch network — easily the most expensive legacy of the bricks-and-mortar banking era. 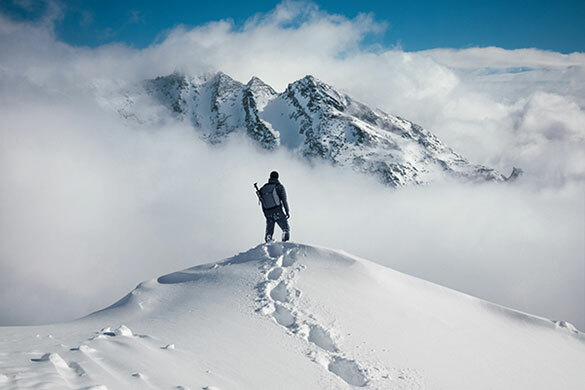 “I’m not sure how this aligns with their technology strategy,” says Nina Gupta, San Francisco–based director of U.S. equity research and sector head for financials at Allianz Global Investors. $99.6 billion in revenues last year easily outpaced the $18.2 billion in earnings and $87.4 billion in revenues at Bank of America, JPMorgan’s biggest rival. With pockets that deep, JPMorgan can wait until the majority of its clients choose to become fully mobile before launching significant cutbacks to its 5,100 Chase branches. In fact, the bank has announced plans to add an additional 400 branches in 15 to 20 new markets over the next five years. And in the meantime, no financial constraints will be placed on the push for more digitization. “We don’t want to ever be told one or two years from now that something strategically important wasn’t done because of budget limitations,” says chief financial officer Marianne Lake. But it takes more than money to build and implement digital breakthroughs. One potential bottleneck: JPMorgan must compete with Silicon Valley for tech-savvy personnel. About 31,000 out of the bank’s total headcount of 252,539 employees at the end of last year were engaged in engineering and development. “But a lot of new graduates looking for a job in AI and machine learning don’t think of a bank as their first choice,” notes Gupta. The nature of research and development has also changed. There are few eureka moments anymore. And when they do happen, they don’t last as long as they used to because technology updates and market changes occur so quickly that new software soon becomes obsolete. “Gone are the days when everybody gets into a sandbox and the product comes out many months or years later,” says Lake. These complexities changed Dimon’s mind about going it alone in technology and led the CEO to rely more on partnerships with fintechs. “We definitely seek out a balance of solutions now in terms of whether we build, buy, or partner with someone,” explains Beer. An example of the new approach to technology involves the use of software for peer-to-peer payments in real time, allowing friends and others to settle bills immediately through cash transfers. In 2010, JPMorgan came out with QuickPay for retail clients. Two years ago it folded QuickPay into Zelle, a more technologically advanced and marketable digital payments network begun by a fintech that is now co-owned by JPMorgan and six other banks. Today 20 percent of all checks are deposited by mobile phone through the Chase QuickDeposit app. Digitized customers can split a dinner bill with friends and contribute their shares in peer-to-peer payments through Zelle. With technology from another fintech, TrueCar, customers can use their mobile phones to locate a car, compare its price across thousands of dealerships, and arrange Chase financing. Later this year, in partnership with yet another fintech, Roostify, Chase will launch a digital mortgage platform that allows customers to track a loan application through closing entirely online. But it’s the growing relationship with Amazon that stirs the greatest excitement. One of the most popular consumer initiatives at JPMorgan is its co-branded credit card for Amazon Prime members. “We have a terrific partnership with Amazon, and it has been very successful for both of us,” notes Smith. Launched in January 2017, the venture underscores the appeal of Amazon’s vast digital reach. Not only does the card deliver access to the 100 million Prime members in one fell swoop, it also allows Chase to benefit from Amazon’s unmatched data on the shopping habits of Amazon clients as their lives and needs evolve through marriage, home and car purchases, and child-raising and college expenses. An obvious example is the one-click purchase for Amazon Prime customers with the co-branded card. It encouraged Chase to think about reducing the number of steps at its ATMs. Withdrawing cash, which used to take six steps, can now be done in three. “A small thing, but we have a maniacal focus on detail to improve the customer experience,” says Smith, sounding quite a bit like Jeff — as admiring JPMorgan senior executives refer to Amazon boss Bezos. The co-branded card for Prime members opens the door to more joint ventures between Amazon and its banking partners for relevant financial products. Amazon is currently in negotiations with several banks — JPMorgan Chase the leading candidate among them — for a co-branded checking account–like product initially to be aimed at younger consumers. For banks, checks and debit cards are barely profitable, especially among millennials, who tend to keep their deposits to a minimum. But the same banking logic doesn’t apply to Amazon. With digital ties to so many millions of clients, Amazon can forgo an expensive promotional campaign for a new checking product. And to avoid having to comply with banking regulations, Amazon can rely on its bank partners in the planned checking venture to hold the deposits. Amazon, of course, has no costly branch network. And for a tech-minded bank that looks to the online giant in so many other respects, this steadfast embrace of branches is perplexing. JPMorgan argues that branches remain the largest source of deposits and that many clients, especially older ones, prefer to interface with sentient beings rather than mobile platforms. “People still want to stare into your eyes when they are making the most significant financial investments of their lives,” says CFO Lake. Executives also point out that JPMorgan Chase currently operates in only 23 states and has no presence at all in Boston, Philadelphia, or Washington, D.C. But those arguments don’t hold sway with competitors who are moving more quickly to discard bricks for clicks. Over the past five years, Citigroup has shuttered a third of its U.S. branches. Bank of America has closed more than a quarter since the financial crisis and has also put in place more than 3,500 “digital ambassadors” at branches to encourage customers to migrate to its mobile services. JPMorgan’s corporate and investment bank doesn’t use branches. Thus, in some respects, the digital revolution here has proceeded in purer form. These days the wholesale bank strives to accommodate the growing number of institutional clients that are no longer satisfied with just receiving a solution to their queries without being given the reasoning behind it. “They want access to our analytics, and they want to receive the solutions on their mobile phones and iPads,” says Daniel Pinto, 54, the other co-president and co–chief operating officer at JPMorgan, who heads wholesale banking. Amazon’s Alexa is the latest platform for delivery of financial information to clients. Clients can request the same research reports that JPMorgan traders receive. They can also ask Alexa for price targets on Apple, Alphabet, Amazon, or any other company share. The jury is still out on some technological initiatives that could further revolutionize banking, especially on the wholesale side — blockchain being the prime example. Blockchain allows financial transactions or any other information to be stored and exchanged by a network of computers without the involvement of banks or governments. Potentially, this could reduce the risk of hacking. But blockchain could also prove as disruptive for global custodians like JPMorgan as exchange-traded funds have been for asset managers. Custodians make most of their money from fees charged to safeguard and transfer institutional and individual assets. And JPMorgan is the world’s largest custodian, responsible for $5 trillion in transfers daily — or about 20 percent of the dollars moved around the globe every day. But the blockchain experience has laid bare the difficulties of measuring payback from tech investments. In 2016, JPMorgan launched an in-house blockchain called Juno to handle payments. It proved an abject failure. The bank then pivoted to a new blockchain project, Quorum, aimed at building an interbank payments platform in partnership with the Royal Bank of Canada and the Australia and New Zealand Banking Group. But an effective blockchain depends on widespread adoption of the same platform by the banking community. There is no indication that Quorum is attracting a large number of banks. And JPMorgan hasn’t decided whether to keep investing in Quorum or spin it off. Other banking projects are thriving. Amazon Cash permits customers to use more than 10,000 retail locations around the U.S. to make cash deposits directly into their Amazon accounts. Under another program, Amazon Lending, more than 20,000 small businesses in the U.S. and abroad have received more than $3 billion in loans from Amazon since 2011, with a third of the total doled out last year. And Amazon is now engaged in talks with several possible banking partners — including JPMorgan Chase — for a co-branded credit card for small businesses that purchase office supplies and other products through Amazon. Profitability isn’t the ultimate criterion for these banking initiatives. Amazon’s main concern is to create a sticky, comprehensive ecosystem that will attract an ever-growing base of retail customers and merchants. For $119 a year, Amazon Prime bundles products and services as varied as food and clothing, music and video streaming, without worrying about profits from financial services. Further initiatives are aimed at expanding clientele in every income bracket. That means creating digital payment methods for underbanked customers who don’t have credit or debit cards to buy goods on Amazon and advancing credit to small businesses that agree to use Amazon’s platform for online sales. In the near future new financial products may help customers purchase larger items such as furniture and automobiles online. Amazon launched a car research site two years ago. “Amazon may end up disrupting banking by default rather than design,” notes Berdak. A look at China’s e-commerce giants should dispel any doubt that Amazon has the potential to vastly expand its financial footprint at the expense of traditional banks. Mobile payment transactions in China for the first ten months of 2017 reached $12.8 trillion, with Alibaba’s online payment platform Alipay accounting for 60 percent of that total and Tencent’s Tenpay platform taking a further 30 percent. Alibaba also claims to have the world’s largest money market fund and issued almost $100 billion in loans over the past five years. Both Chinese companies have expanded elsewhere in Asia and parts of Europe. They would have a larger presence in the U.S. if they weren’t held back by Washington’s concerns over data security. A bid by Alibaba affiliate Ant Financial to purchase Dallas-based payments company MoneyGram International for $1.2 billion was rejected in January by a U.S. regulatory panel for national security reasons. But fears over the growing global reach of Chinese internet banking may someday induce Washington to loosen its regulatory shackles on Amazon. After all, Glass-Steagall legislation — separating commercial and investment banking — was repealed in 1999 when U.S. banks convinced Congress that they risked losing market share to European rivals that didn’t face similar regulatory constraints. Even if regulations remain in place, the accumulation of financial services could transform Amazon into a banking juggernaut far sooner than many experts suspect. “We could imagine Amazon’s banking services growing to more than 70 million U.S. consumer relationships over the next five years or so — the same as Wells Fargo, the third-largest bank in the U.S.,” wrote Bain analysts in their recent report on Amazon’s banking aspirations. That means scores more billions of dollars for tech projects before Dimon’s scheduled retirement in 2023 — with either Smith or Pinto as his likely successor. But not all of the bank’s capital expenditures are earmarked for technology: A year after Dimon leaves, a 70-story global headquarters will be inaugurated on the same mid-Manhattan site as the current, smaller building. Apparently, bricks-and-mortar edifices are the best way to celebrate a digital revolution.